Second in our series on jewels that play with light is the mysterious moonstone, along with its two “sisters” labradorite and sunstone. All three are feldspar stones, a family that comprises about 60% of all minerals found on earth. A shared characteristic of all the feldspars is that their internal structure is crystalline. It’s this crystalline structure that allows a very select few of them to display an active and beautiful interplay of light and color. The moonstone has been known and loved since very ancient times. The Romans thought it was composed of frozen moonlight and it has been found in Roman jewelry dating as far back as 100 A.D. Both the Romans and Greeks associated it with their moon goddess. 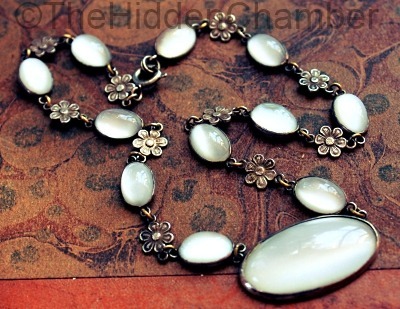 Some Asian cultures believed that moonstones contain a live spirit whose ghostly movements were seen within. In India they are often called “dream stones” and tradition has it that wearing a moonstone to bed or placing one beneath a pillow will bring beautiful dreams. 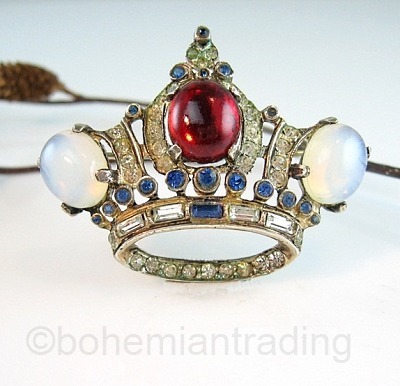 During the Edwardian and Art Nouveau periods it was extensively used in jewelry. The chemical composition of true moonstone is potassium aluminosilicate (potassium, aluminum and silica) and it is classified as an orthoclase feldspar. If you look at a moonstone through a high powered microscope you will see that its internal structure is made of tiny crystal platelets arranged in layers. Distributed within these layers there are also inclusions of tiny platelets of sodium feldspar. Since the body of a moonstone is either colorless or highly translucent, light travels into its interior and thus inevitably strikes some of those tiny platelets of the sodium material. When that happens, the light is then directed back outward instead of passing completely through the stone. The scientific name for this bouncing-back action is schiller. Depending on the precise color of the body of the stone, its precise chemical composition and the thickness and depth of the layers, the visible color of the schiller may be either white or blue. Blue is the most prized, and the darker shades most of all. As the stone is moved, the blue sheen appears to shift and float within the interior of the stone (much like the behavior of precious opal) as the light interacts with the inclusions inside. 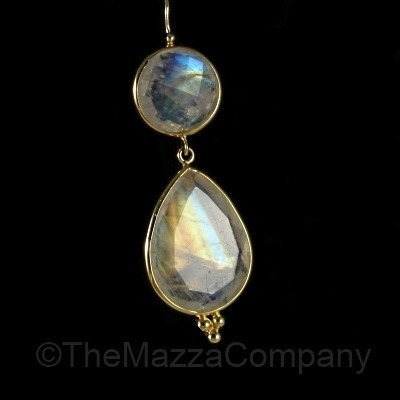 This specific play of light and color within a moonstone is called adularescence. Moonstones are graded and priced according to their body color, internal clarity, the color depth of the blue sheen, and of course size as well. Because adularescence is a result of interaction with light, it is very important that moonstones be cut so as to maximize its effect. An incorrect cut can greatly impair or even destroy a stone’s adularescence. The optimal cut for a moonstone is a high domed cabochon which is why the great majority of moonstones are cut in this shape (either round or oval). Skilled cutters can also facet a stone in order to enhance the schiller effect if its internal structure needs a bit of extra help to show at its best. 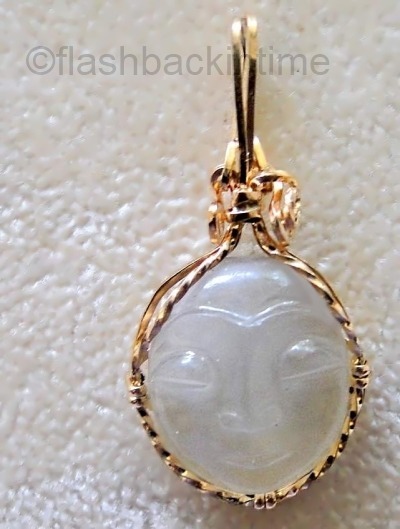 Stones that display a white sheen (or extremely pale blue) are often carved into “man in the moon” faces. Moonstone always shows to its best advantage when worn or displayed against black; much like the effect of an opal doublet, a dark background enhances the intensity of other colors within a light-colored translucent or transparent stone. The colorplay of moonstone is not always limited to just the blue shades; flashes of yellow, gold, and even aqua may also be present, as can be seen in the two earrings below. The pear shaped stones have been cut in the same way but the “internal color scheme” of each is quite different. The most sought-after moonstones (nearly transparent and with a decided blue sheen) usually come from Sri Lanka (formerly Ceylon). Moonstone is also mined in Myanmar (formerly Burma), South America, Madagascar, and India. The earliest commercial mines were located in the Adula mountain range in Switzerland… whence came the name for its characteristic sheen, adularescence. Moonstone and its close relatives fall between 6 and 6.5 on the Mohs scale of hardness, which makes it a relatively soft stone (a fact that enables it to be carved as well as faceted). This also means that the best cleaning method is to simply buff it with a soft cloth. 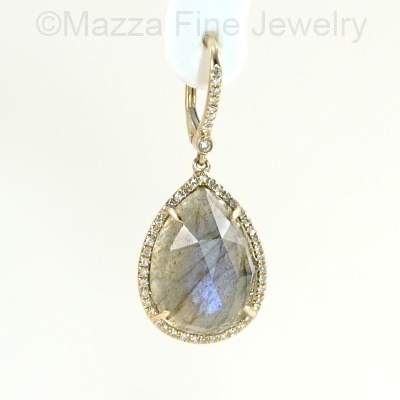 Moonstone is an alternate birthstone for June and the traditional jewelry stone for a thirteenth wedding anniversary. 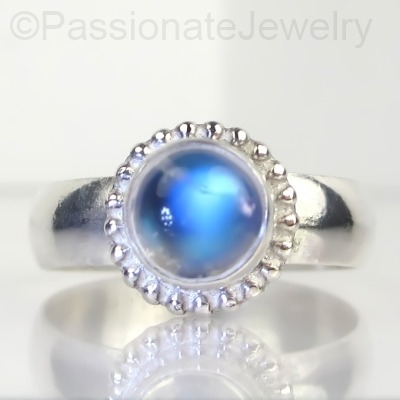 There is no current chemical or irradiating treatment to enhance the internal color play of a moonstone; however, if you see an extremely bright or deep blue moonstone at a too-good-to-be-true price, that stone may have been surface-coated. Moonstone has been imitated in glass, acrylic and rhinestones, although glass definitely does the best job of it! Although the overall effect is similar to that of fine natural blue moonstone visually, it is easily differentiated by the fact that the blue shimmer does not vary much with a change of viewing angle. It also does not appear to shift and move within the glass stone itself. The effect is hard to describe in words but is immediately apparent when a true and faux moonstone are held side by side. 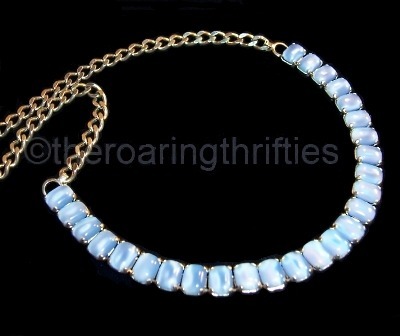 Nevertheless a well-made crystal glass faux moonstone is often a very attractive piece of jewelry indeed, as evidenced by the vintage necklace below. 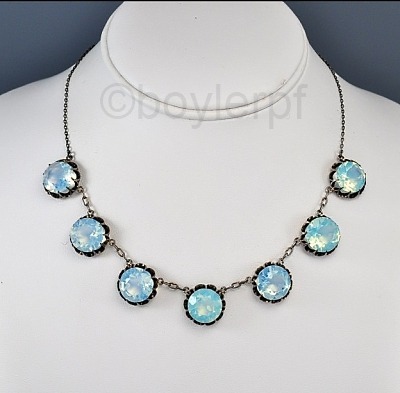 The frosty blue glass faux moonstones in the necklace below were created as domed rectangular cabochons. This vintage Corocraft brooch combines faux moonstones with a Lucite “ruby” cabochon; clear and blue rhinestones simulate diamonds and sapphires. The type of Lucite (acrylic plastic) known as “moonglow” was also made in a pale blue color and is sometimes referred to as “faux moonstone” or “moonstone Lucite”. These were often produced in cabochon shapes but also as beads. 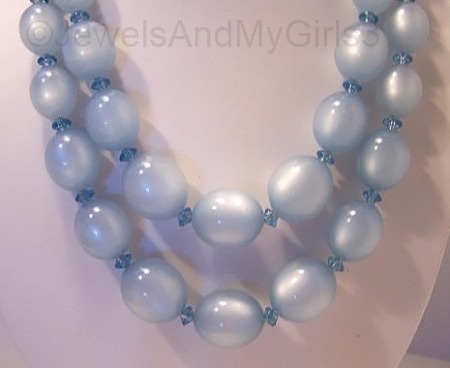 Although they do have a characteristic satiny surface effect their appearance does not really change in response to light and so they are best appreciated for their soft, pretty pastel-blue color and attractive sheen, as in this vintage moonglow Lucite necklace. If I wasn’t trying to be alliterative I would title this section “Confusing Labradorite” – because not only is labradorite often confused with moonstone, there is also confusion within the different types of labradorite! So it’s best to start by explaining how labradorite differs from moonstone. 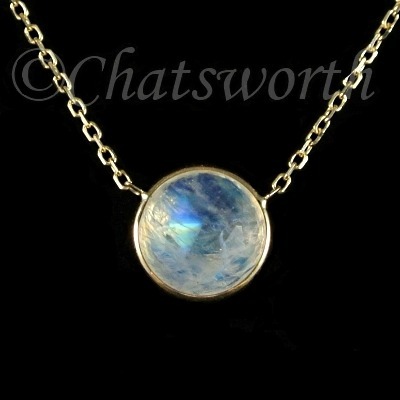 Unlike moonstone, one of the main chemicals found in labradorite is not potassium but calcium. The action of light striking internal layered inclusions (of ilmenite, in this type of stone) and being bounced outward is similar, but because of the chemical differences in labradorite – which usually has a brownish grey body color – the color effect is different and so is the name it is given: labradorescence. Labradorite is classified as a plagioclase and “calcium sodium” feldspar; moonstone is an orthoclase and “potassium sodium” feldspar. This is why moonstone and labradorite are “sister” stones… they are in the same family (feldspar) but gemologically they are different. Moonstone is moonstone, and labradorite is labradorite. As you probably have guessed, labradorite was first discovered in Labrador. The Eskimos have a legend that when the world was young the Northern Lights were imprisoned in the rocks along the Labrador coastline. One day a mighty Eskimo warrior was walking along and heard a mysterious sound coming from the rocks, as if someone were calling for help. He struck a rock with his spear as hard as he could and split it in two, allowing the beautiful colored lights inside it to rush upward into the sky. He freed as many of the lights as he could, but could not break every one of the stones. The stones that he was unable to break were destined to forever entrap the “lights” within, which we see today in the shifting color sheen of labradorite. 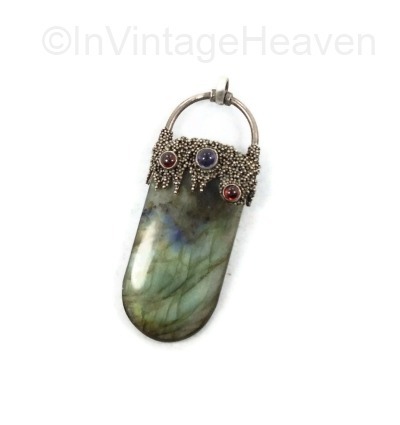 The pendant below exhibits shades of green with a ‘splash’ of blue. 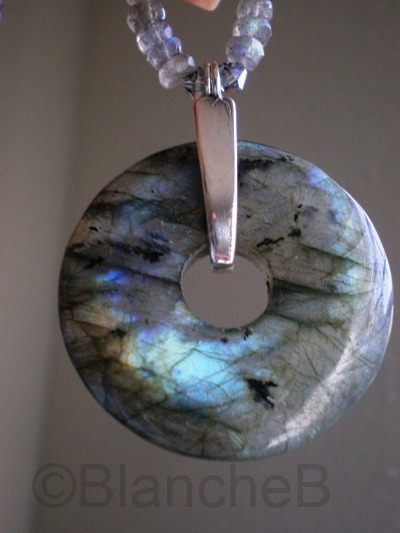 Below, a circular labradorite pendant suspended from a necklace of faceted labradorite beads displays tints of silvery blue highlighted with dramatic black. The grayish green body color of this pear shaped labradorite exhibits a central blue schiller in response to light. Labradorite is also found in other places than Canada. The stones from Madagascar have inclusions that can produce a yellow, green, or bluish sheen; but the most beautiful type of labradorite was discovered in Finland in the 1940s. This rarest and naturally most expensive variety of labradorite is mined in Finland and no matter how you spell the name, it’s quite dramatic. It is the only variety of labradorite in which fine specimens are considered to be of true gem quality. The body color appears as a transparent to highly translucent dark grey and the flashes of iridescent color produced within it are intense hues which can range from golden yellow to bright blue to turquoise/aqua to greens through orange to red – literally all the colors of the spectrum, hence its name. The most prized color in spectrolite is purple – and the deeper the better! 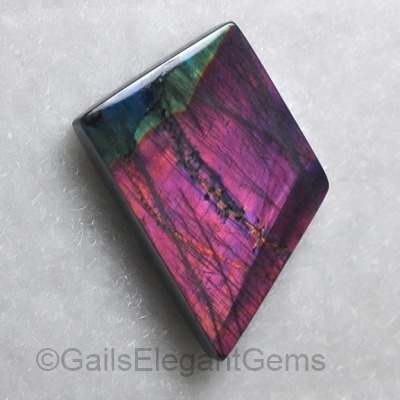 It is the closest in the feldspar family to the opal in ‘color special-effects’. Some dealers refer to it as “black moonstone” because of the deep body color but of course that attribution is incorrect. It’s important to be aware that true, genuine spectrolite is found only in Finland. There is a variety of labradorite that is mined in Madagascar which has richer colors than stones found elsewhere, and these stones may be sold as “spectrolite” because of the general resemblance. However, the genuine stone is mined only in Finland and excellent specimens are becoming harder and harder to find. The rich royal-purple stones below are true (Finnish) spectrolite. This teardrop-shaped Finnish stone below shows green striations so bright that they are almost chartreuse! This interesting stone below, also from Finland, displays a combination of teal, gold, orange and brown – perfect for use in creating a piece of jewelry to coordinate with the colors of autumn. Now here is where things get doubly confusing! The stone commonly called “rainbow moonstone” or “blue rainbow moonstone” in the trade is neither a true moonstone nor quite the same as the types of labradorite we’ve just looked at. In fact it is a fairly recent discovery on the overall timescale of gemstones. During the 1960s a new stone was discovered in a small mining area in southern India. It was definitely a feldspar with many characteristics of labradorite but also some significant differences. For one thing, the body color is very light – quite similar to that of true moonstone – because these newfound stones do not contain ilmenite which is the mineral that gives labradorite its darker color. 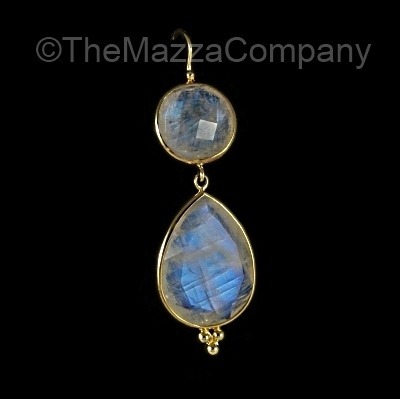 So in “base color” these new Indian stones do resemble true moonstones. However…its internal structure is very like that of spectrolite labradorite, which means the color effects can be wide-ranging. Some stones display a blue sheen (the darkest of which is called “royal blue”); others display either as a multicolor (which the retail jewelry trade has dubbed “rainbow”) or as “rainbow” with blue being the predominating color (known as “blue rainbow”). These descriptive phrases were coined by the trade shortly after the stones were discovered, and they have stuck firmly ever since and are now widespread. But are these stones truly moonstones, as their commercial names imply? Not according to Dr. Henry Hänni of the Swiss Gemmological Institute, they aren’t. Dr. Hänni was the first to publish the chemistry and formal identification of these new Indian labradorite stones, so he is definitely the top authority in this instance and he has stated: “People who use the term ‘labradorite moonstone’ or ‘rainbow moonstone’ are on a ‘red emerald’ track. The historical and global agreement of the term ‘moonstone’ is used only for orthoclase. 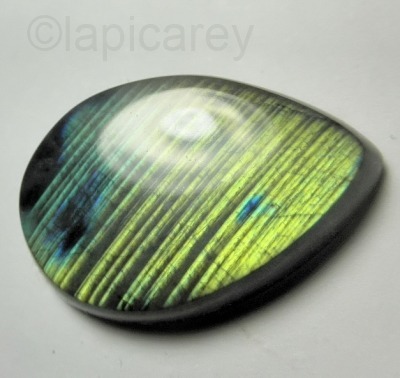 Labradorite is not a moonstone….. There is no reason – except commercial – to call labradorite a moonstone; it’s confusing, and incorrect.” So there you have it: Not only is there no such thing as a “labradorite moonstone” (it’s either one or the other!) but the stones described as “rainbow moonstone” are technically “rainbow labradorite”. It was perhaps inevitable that the early dealers would create a connection to the more familiar (moonstone) gem, based on the new stone’s appearance – it does look more like moonstone than labradorite – and of course marketing is key in the industry …. as evidenced by the ever-growing list of “designer” diamond cuts!. 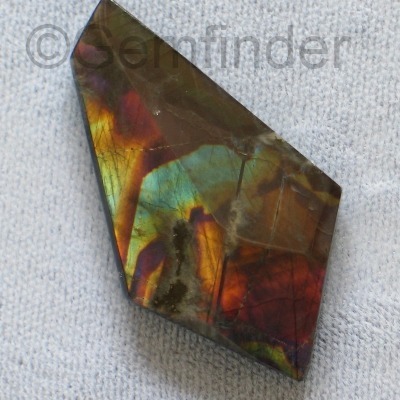 This is not to denigrate the extremely attractive rainbow labradorites – far from it! – but simply to make clear that despite their description in the jewelry trade they are not true moonstones. The ring below is an example of a blue rainbow stone, which shows off very nicely set in silver. 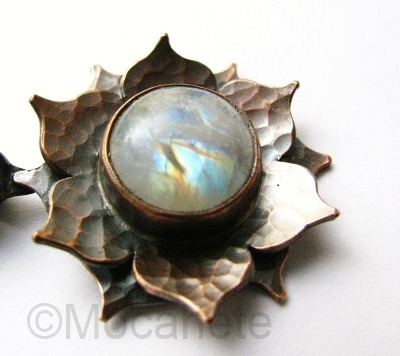 This lovely round cabochon flashes shades of blue, teal and coppery gold; the artisan has created a hammered copper flower for its setting which perfectly complements the similar colors within the stone. 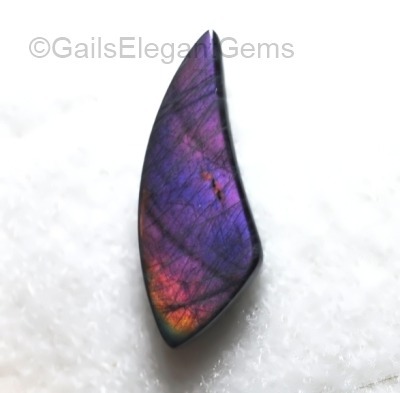 Another term for the unique iridescent effect that this family of stones produces is peristerescence (pronounced pear-iss-ter-essence) or alternately, peristerism. The word derives from the Greek word “peristera” which means pigeon… a bird whose neck feathers flash iridescent hues as they walk along gently bobbing their heads. It should also be mentioned that not all moonstones and labradorites exhibit noticeable schiller; some have very little or even none at all. The effect depends entirely upon the internal structure of each stone and of course how they are cut as well. Stones that are very small and/or exhibit little or no schiller are often made into beads. Although a gemologist would take me to task for not including these in the labradorite section, I believe that the sunstones (sometimes called heliolite, from the Greek god of the sun, Helios) are sufficiently different in appearance to warrant a section of their own. Sunstones are a plagioclase feldspar which places them firmly into the labradorite group but they certainly would never be confused with their “cool”-appearing sisters. In the case of sunstone, the internal inclusions that produce schiller are of a metallic nature. This causes the resulting sheen to have a noticeably spangled effect which is extremely pretty. As with any metallic, the brilliance of the sparkle depends greatly on the exact angle and intensity of the light; readers old enough to remember the wildly popular “heavy metalflake” custom car paint jobs will know exactly what I mean! The particular metal found within sunstone is copper, and the actual colors that any individual sunstone produces will depend on the percentage of copper in that particular stone. Although this unique metallic component makes all sunstones attractive, one particular variety stands out from the rest. The specific type of sunstone found in Oregon and neighboring regions is commonly called Oregon Sunstone in the trade. Its typical body color is transparent to highly translucent; in fact sometimes at first glance the viewer may be disappointed at the apparent lack of “color interest”. But as the stone is turned at different angles there will suddently appear sparkling flashes of color reminiscent of glittering champagne bubbles. 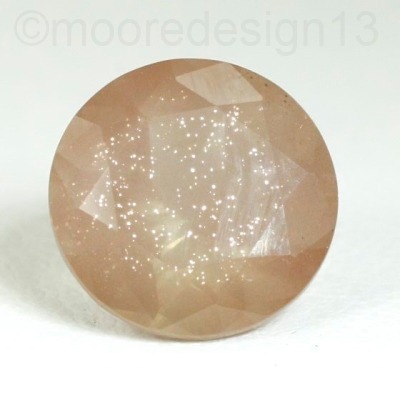 A property of Oregon sunstone is that its schiller tends to be more concentrated in the center of the stone and thus the color-spangles effect is more intense there, gradually diminishing as it moves outward in a sort of starry fireworks effect. The photo of this round brilliant-cut sunstone captures the effect beautifully. In order to take advantage of Oregon sunstone’s exceptional clarity and unique metallic flash, it is often cut as a faceted gem rather than the more typical domed cabochons of moonstones and other labradorites. 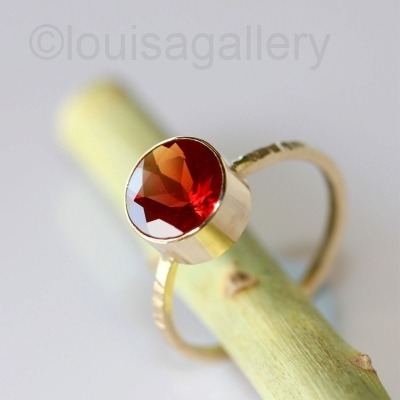 This rich deep orange-red sunstone makes a simple but dramatic 14k gold ring. 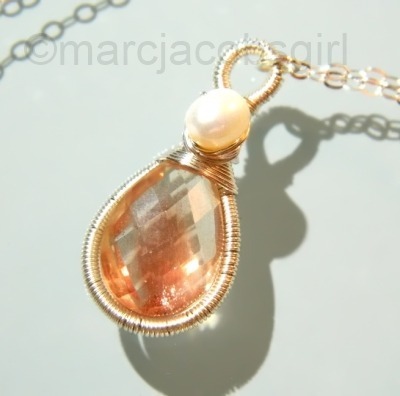 The deliciously peach-hued sunstone shown below has been set in a pendant with a freshwater pearl. 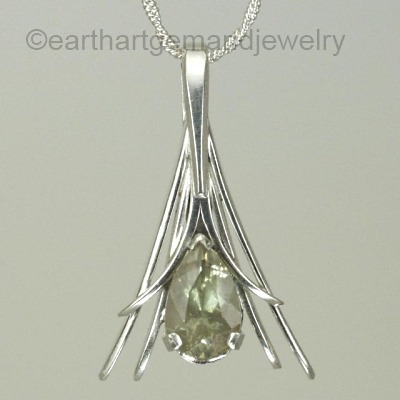 Sunstone is not limited only to the warm-colors range, as can be seen in a soft sage green stone set in a cool sterling silver pendant. The best way to describe the difference between the color effects of sunstone vs. its sisters moonstone and labradorite is to describe the first has having a “sparkly shimmer” and the other two as having a “satiny shimmer”. It is not unusual for stones to be quite large, sometimes several inches wide. Oregon is justly proud of its resource and has made it the official state gemstone. My sincere thanks to the Etsy sellers who graciously gave permission for me to use their photographs to illustrate this article; each of those images is a live link to that item. Thanks also to Wm. Mazza Fine Jewelry for lending me several of their lovely earrings to photograph and for the link to their website. Thank you for the easily understood descriptions and differences with each stone. There’s a black version that’s mined in Mexico – I don’t think it’s called moonstone, but apparently it’s only found in Mexico. I have a pendant, and looks exactly like the white one, but it’s more greenish black. Lovely.